With the arrival of Dr Risto Jeremic in 1904, people of Tuzla had their first surgeon at their disposal. He was soon to become the new Tuzla hospital manager. After approval provided by the authorities, in the year 1906 Dr Jeremic funded the construction of his private sanatorium on a hill named Kojsino, just above the Hospital itself. The sanatorium had 2 pavilions. The State general hospital was established in year 1919, after the merge of the County hospital and sanatorium. 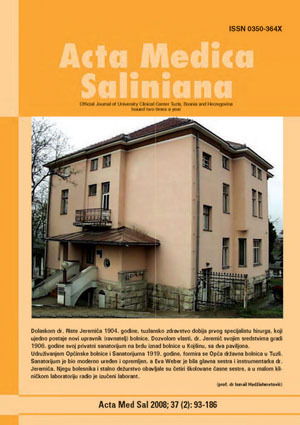 The sanatorium (recent photo on the cover page of this issue), had a modern equipment for that time period. Mrs. Eva Weber was the Head nurse of the sanatorium and also the instrumental operative nurse to Dr Jeremic. Round the clock care for the patients was provided by 4 nuns while a small clinical laboratory was operated by a single technician.